It is possible that there is nothing in this world that we like better than cookies...except beer. So when Branding & Buzzing approached us about their #SaminHand project we could not say yes fast enough! We racked our brains trying to come up with something that would be both unique and delicious, and after discarding more than a few awesome ideas - Beer and Butter Poached Shrimp; Beer Risotto - we settled on a Chocolate Chip, Sam Adams Beer and Candied Prosciutto Cookies. 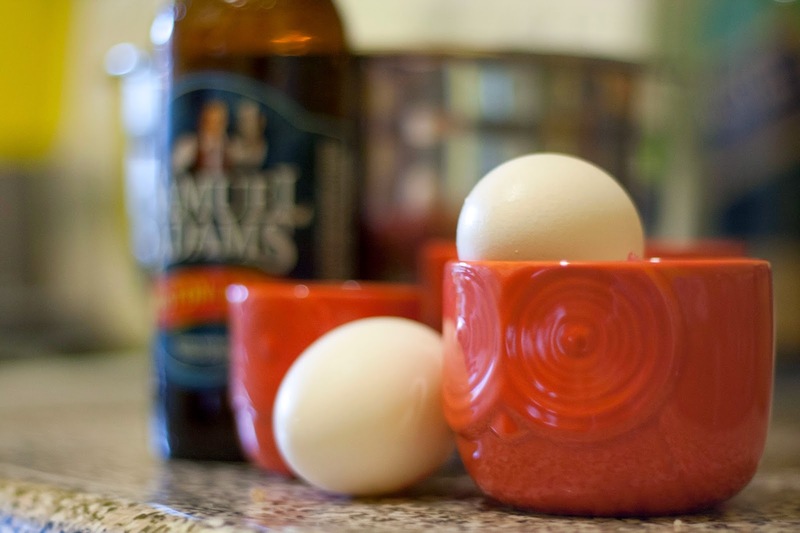 We used Sam Adams Boston Lager, which we picked up at our local Beer Store. The Boston Lager has a rich, hoppy flavour with notes of citrus and caraway seed. 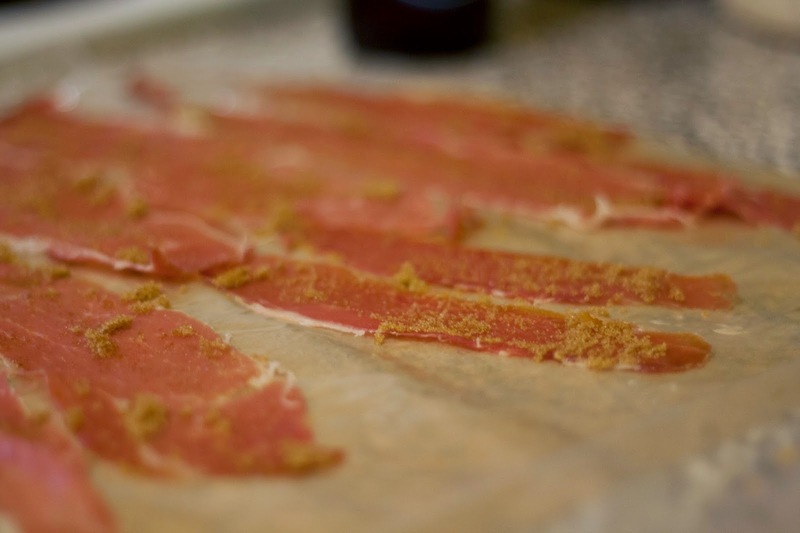 Begin by making your candied prosciutto. Preheat your oven to 325. Put prosciutto slices in a bowl and toss with the brown sugar. Cover a baking sheet with parchment and arrange the prosciutto in a single layer. Top with another layer of parchment and another baking sheet. The baking sheet will flatten the prosciutto as it cooks. Place the tray in the center of the oven and bake for 10 minutes. Check the prosciutto by lifting the top tray and parchment. If it is not golden brown and fairly crispy, resist the temptation to turn up the oven temperature, and cook it for 10 minutes longer. Once cooled, dice and set aside. In a pot over medium - high heat add the beer and cook, stirring occasionally, until reduced to about 1 tablespoon, about 8 to 10 minutes. In the bowl of a stand mixer, add the butter and both types of sugar and beat until well creamed- NOTE: if you don’t have a stand mixer, go ahead and use your hands. Add both eggs and mix. 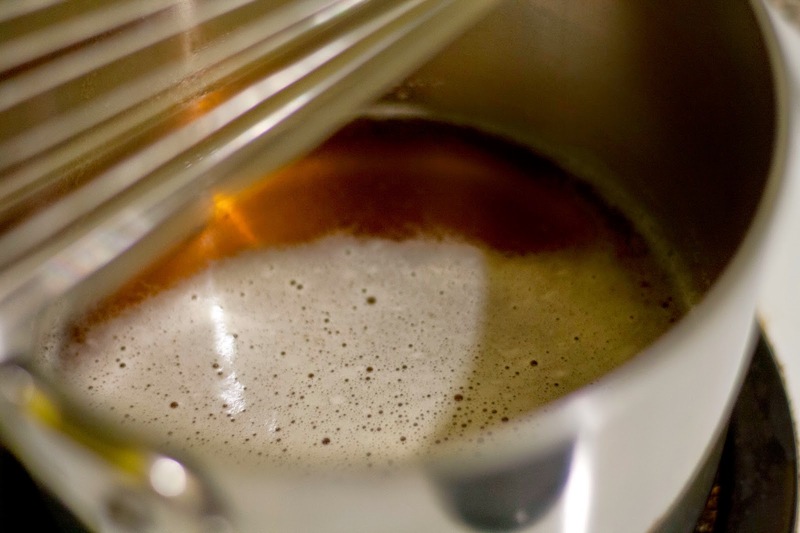 Add the 1 tablespoon of reduced beer, vanilla extract and beat until well combined, scraping the bottom to make sure all the ingredients are well combined. In a separate bowl, mix the flour, baking soda, cornstarch and salt. Add the dry ingredients to the mixer and mix on medium/low speed until just barely combined, being careful not to over mix. Add the chocolate chips and candied prosciutto, and stir until incorporated. Preheat the oven to 350. Cover a baking sheet with parchment paper and scoop golf-ball sized scoops of dough, flatten and place in the oven. Bake the cookies for 12 - 15 minutes or until light golden brown. Transfer to a wire rack and cool. 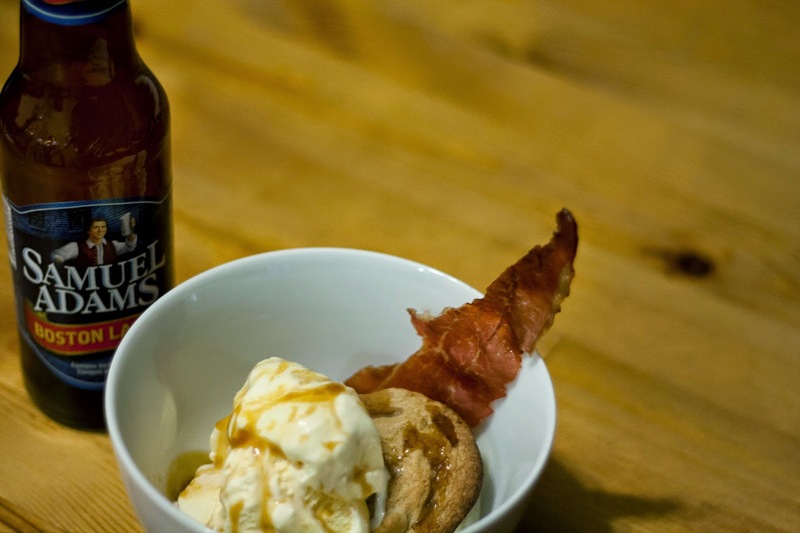 While the cookies are cooling make your Caramel Beer sauce. In a saucepan over high heat add the sugar and beer. Whisk until the sugar has melted, then stop stirring. Allow the mixture to boil, about 6-8 minutes. Turn off the heat and immediately stir in the baking soda. The mixture will bubble furiously. Once it has stopped bubbling, add the butter, vanilla and salt. IF your sauce has not thickened, place it back on the stove, on low heat and let it simmer for an additional 5 minutes. Allow the sauce cool for about ten minutes. 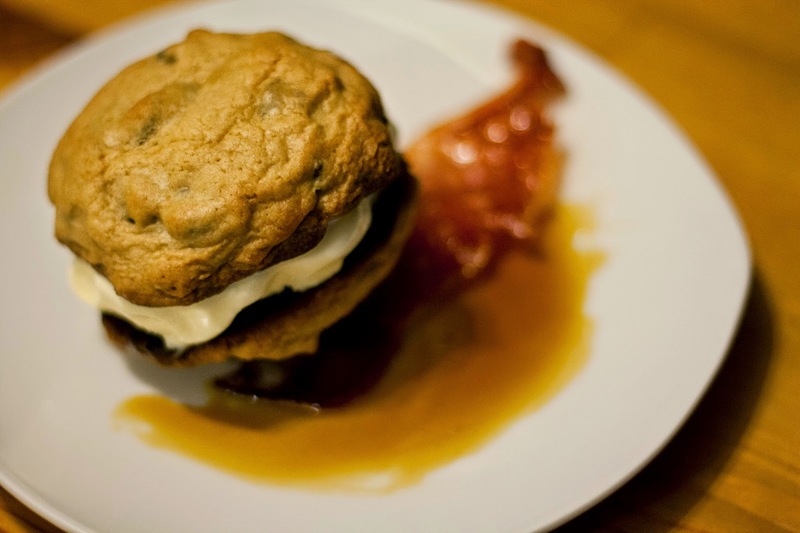 Serve your cookies with a scoop of Vanilla ice cream and drizzle with the Caramel and Sam Adams beer sauce.